May through July 2017 Outlook. But dry springs typically lead to higher-than-normal summer temperatures, he said. Water temperatures in the Gulf of Mexico are also higher than normal, which can be a contributing factor to summer heat. East Texas received reasonably wet weather this spring, but much of Central, West Texas and South Texas are drying out rapidly. 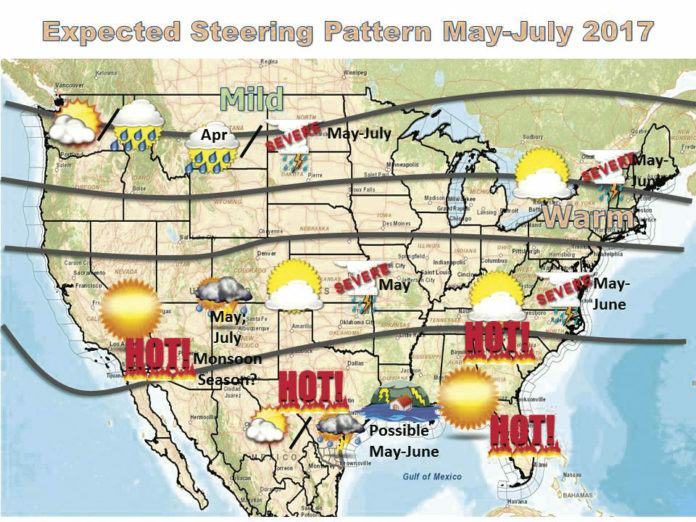 “We expect the U.S. weather steering pattern from May to July 2017 to look quite similar to that from April through June,” forecasters at the National Weather Service in Brownsville wrote in their May-July outlook. That isn’t necessarily good news for the Rio Grande Valley, where above-average temperatures have been occurring for the past 10 months. In late April, record-breaking high temperatures were set with Brownsville and Harlingen hitting 104 degrees on April 26, with McAllen hitting 105 degrees. Brownsville and Harlingen set heat records for the date, while McAllen was off by two degrees. “As far as temperatures are concerned from June, July and August, we’re looking at pretty much above-normal temperatures around here, and as far as precipitation goes, we pretty much have an equal chance of wet or dry,” said Joseph Tomaselli, senior forecaster with the weather service in Brownsville. “In my opinion, the best chance of rainfall we could see is a tropical system or a mid-level disturbance parking over us for a couple of days or parking over the state of Texas,” he added. A break in the weather pattern might be what’s needed to add some wetness to what is becoming a very dry region. Since the beginning of the year, Brownsville has received just 4.04 inches of rain this year (average is 6.50 inches), and Harlingen has recorded precipitation of just 4.52 inches (average is 6.69 inches). McAllen was the beneficiary of some significant rainfall earlier in the year, recording 4.88 inches of rain. But the city is still under its average of 5.76 inches for the year from January through mid-May. But McAllen, like Brownsville and Harlingen, also finds itself in the shadow of what could become a significant regional drought if those precipitation numbers continue to be below average. The area from Cameron County to Starr County is currently rated as being in abnormally dry to moderate drought conditions. Analysts say this degree of dryness in the Valley is something more commonly seen in late summer and early fall. Much of the Valley was in “extreme drought” conditions for several months in 2013 until rain eased the situation by mid-September of that year. The summer of 2017 could be shaping up to make a run at another drought year, with July shaping up as being a key factor in how things shape up. “Unless a window of opportunity opens for a Hurricane Dolly, tropical wave or similar event (2008 was the best example of this), there is no compelling reason to think ‘La Canicula’ won’t prevail and lean the month to the dry and hot side,” the weather service predicted for its July forecast. “La Canicula” is Spanish for the Dog Star Sirius, a phenomenon in the constellation Canis Major that becomes visible in late July and is regarded as a harbinger of continued hot weather. Will the inevitable Southwest U.S. atmospheric systems open up and move east into northern Mexico and West Texas, driving sufficient tropical moisture into the Valley to provide ample rainfall capable of floods, as well as thunderstorm clusters that can produce large hail, damaging wind and frequent to excessive lightning? Or will they spin in place near Baja, California, keeping rain potential well west of South Texas and the region un-der upper-level ridging? Or a third possibility: Will the waves lift far enough north into the southern/central Plains and keep us “waving” to the rain — increasing the potential for expanding dry/drought with the high evaporation rates and sun angle?